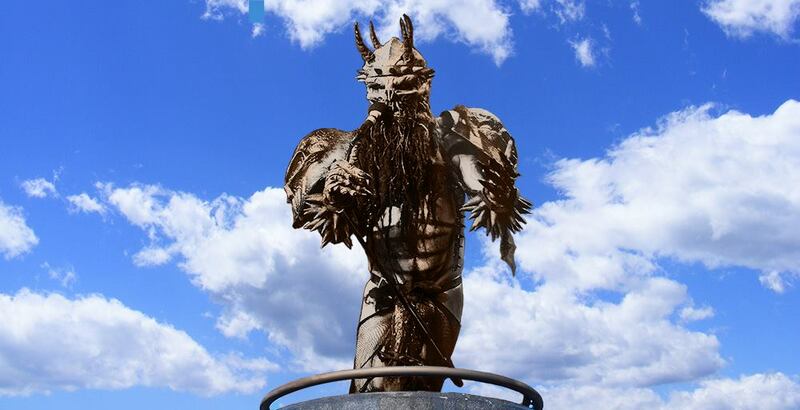 RICHMOND, Va. – Speaking in front of an eager crowd gathered at the Virginia Capitol building, Mayor Levar Stoney revealed today that a statue of the notorious Oderus Urungus, famed lead vocalist from the local metal band GWAR, would be added to Richmond’s historic Monument Avenue. GWAR’s notorious guitarist Michael Derks, more commonly known as Balsac the Jaws of Death, was recently diagnosed with bone marrow cancer, and has a gofundme set up to assist with medical bills. Show your support by making a donation today. Going into further detail on the decision, Mayor Stoney cited the city’s increased effort to balance the sometimes negative view of the city’s Confederate heritage. He noted that while Oderus may seem out of place on a street filled with Confederate icons, he is the first of many additions that will help the city move in a more inclusive and progressive direction. The announcement culminated with the grand unveiling of the bronze Oderus statue, which depicts the singer in his traditional attire. The unveiling was done while speakers blasted GWAR’s “Saddam A Go Go,” one of their more popular anthems. Long time GWAR manager Sleazy P. Martini was also on hand at the event and happily addressed the crowd. The new statue is to be placed at the intersection of Monument Avenue and Thompson Street. According to multiple City Hall aides, Oderus beat out several other iconic Richmonders, including Pat Benatar, D’Angelo, and Jimmy Dean. Fancy The Peedmont? Check out our online store for some cool swag. this is exactly what i mean by richmond wastes so much tax payer money, by the way , ,R.E. LEE never owned a slave and was asked to head one of the northern armys but had to be loyal to his birth place.